...... keeps your inbox spam-free, and allows you to browse the web privately and securely with the entirely new Panda Safe Browser. With the Parental Control, your children can browse the Internet safely.Maximum protection against all kinds of Internet threats with Panda Internet Security for Netbooks. * Panda Internet Security for Netbooks allows you to get the most of your Netbook for any offline or online activity, such as buying or banking online, with confidence and without interruption. * It protects you from viruses, hackers, online fraud, identity theft and other known and unknown threats, and keeps your mailbox free from spam. * Surf the Internet safely with Panda Safe Browser and block inappropriate content for your kids with Parental Control. Qweas is providing links to Panda Internet Security for Netbook 2012 17.00 as a courtesy, and makes no representations regarding Panda Internet Security for Netbook or any other applications or any information related thereto. 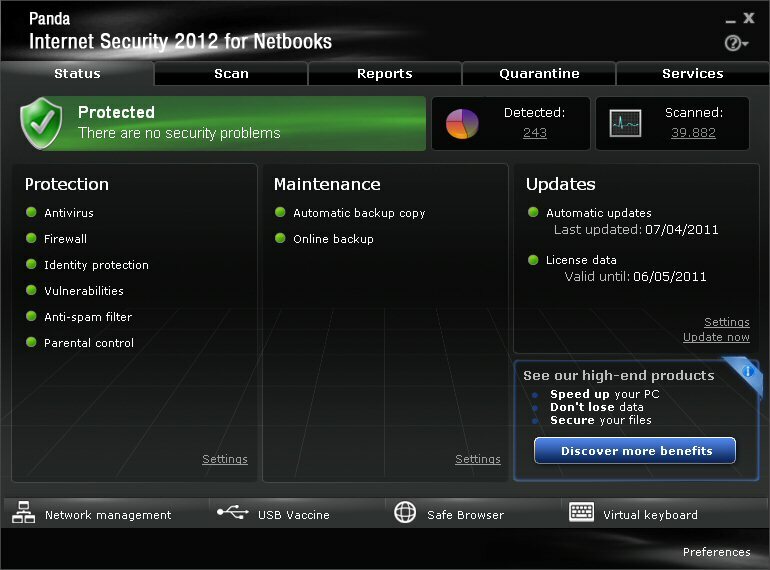 Any questions, complaints or claims regarding this application Panda Internet Security for Netbook 2012 17.00 must be directed to the appropriate software vendor. You may click the publisher link of Panda Internet Security for Netbook on the top of this page to get more details about the vendor.